that is, begins protein catabolism by hydrolysis of the peptide bonds that link amino acids together in a polypeptide chain. Proteases can be found in animals, plants, bacteria, archaea and viruses. Proteases have evolved multiple times, and different classes of protease can perform the same reaction by completely different catalytic mechanisms. The field of protease research is enormous. in 2004, approximately 8000 papers related to this field were published each year. 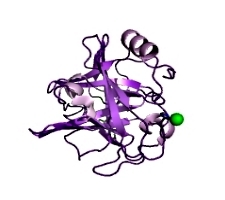 Proteases are used in industry, medicine and as a basic biological research tool. Digestive proteases are part of many laundry detergents and are also used extensively in the bread industry in bread improver. or for completely artificial functions (e.g. for the targeted degradation of pathogenic proteins). Highly specific proteases are commonly used to cleave fusion proteins and affinity tags in a controlled fashion. Our partners, the Yaxin Biotechnology is a high-tech enterprise that focuses on researching and producing the recombinant enzymes. 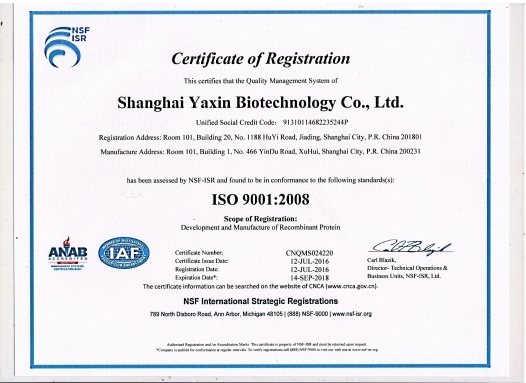 YaxinBio is the first and only a professional company on researching and producing the recombinant carboxypeptidase B and recombinant trypsin in China. Both of the two recombinant enzymes are specially used in the recombinant human insulin production, and exporting abroad. Recombinant trypsin is used in the cell culturing process, which conforms to the 2014 USP. 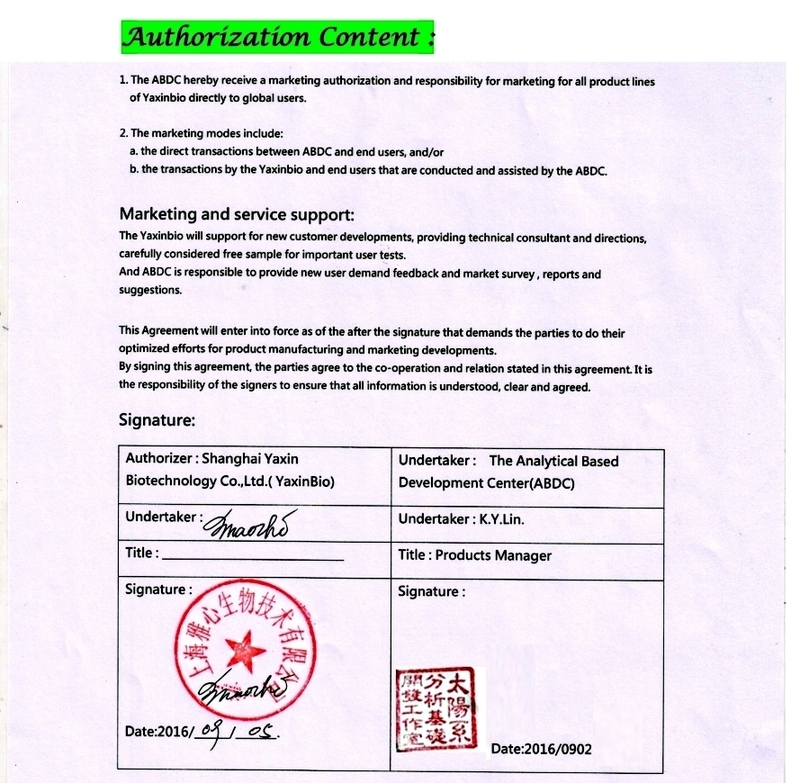 Animal original free is very important for the production of antibody and vaccine . Usage of recombinant trypsin fundamentally solves the problem of animal original virus contamination in the recombinant human insulin production. enzymes and sequencing grade enzymes with global quality, independent intellectual property rights and much helpful costs. Sequencing Grade Carboxypeptidase B SRCPB01 NLT 200 unit/mg pro 100μg;1mg protein structure and sequence analysis, antibody quality control. 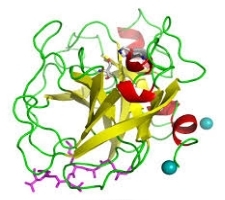 Kex2 is a Ca2+-dependent serine protease and cleaves at C-terminal site of Lys-Arg, Arg-Arg, Pro-Arg in pro-α-factor and killer-toxin precursors maturing. 2.Services to dealers in the countries with counseling and assistance. 3.Integration of international technical cooperation projects. for the establishment of more helpful product services and cooperations. Source: Rat carboxypeptidase B, expressed in E. Coli. 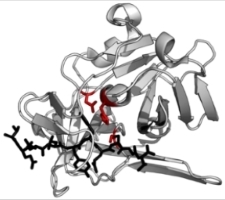 Carboxypeptidase B catalyzes hydrolysis of the basic amino acids lysine, arginine and histidine from the C-terminal end of polypeptides. The molecular weight is 34,500 daltons, the pH optimum is 8.0, and pI is 6.0. 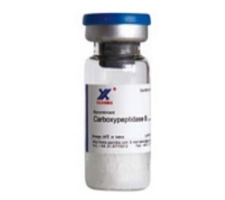 Carboxypeptidase B is competitively inhibited by arginine and lysine. The enzyme is also inhibited by metal chelating agents, e.g., EDTA. Recombinant Carboxypeptidase B is expressed in E.Coli and purified by high pressure liquid chromatography. No protease inhibitors such as PMSF are present in the preparation. No chymotrypsin, carboxypeptidase A, or other proteases contaminant. 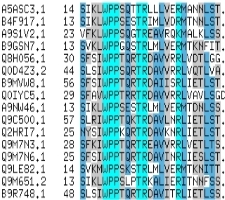 Protein structure and sequence analysis, such as hydrolyze basic amino acids lysine, arginine and histidine from the C-terminal end of polypeptides. To prepare 1-10mg/ml carboxypeptidase B with sterile water or 25mM Tris-HCl pH 7.65. The ratio to aimed protein is 1:50 to 1:1000 (w/w), the optimum pH is pH 7.0-9.0. Recommend recombinant carboxypeptidase B lyophilized should be stored under 2-8℃ in sealed container. It is stable within 24 months and no activity lose after 10 times repeated freezing and thawing. 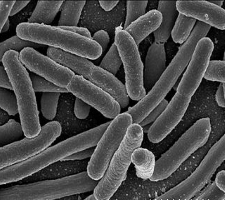 Source: Expressed in E. Coli. Carboxypeptidase B catalyzes hydrolysis of the basic amino acids lysine, arginine and histidine from the C-terminal end of polypeptides. The molecular weight is 34,500 daltons, the pH optimum is 8.0, and pI is 6.0. Recombinant Carboxypeptidase B (EC 3.4.17.2) is expressed in E.Coli and purified by high pressure liquid chromatography. There is no trace of other enzyme (such as carboxypeptidase A and chymotrypsin) activity. he chances of activity loss in the process of transport and storage. activities found in extracted enzymes with lower purity level. 3) Less than 10ppm of recombinant trypsin. NIT DEFINITION：One Unit of carboxypeptidase B activity hydrolyzes one micromole of hippuryl-L-arginine per minute at 25℃, pH 7.65. To prepare 1-10mg/ml carboxypeptidase B with sterile water or 25mM& Tris-HCl pH 7.65. The ratio to ;aimed protein is 1:50 to 1:1000 (w/w), the optimum pH is pH7-9. 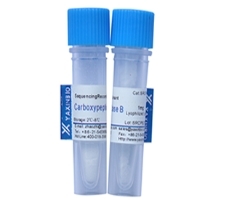 Recommend recombinant carboxypeptidase B lyophilized should be stored under 2℃-8℃ in sealed container. It is stable within 24 months and above 90% activity remained after 10 times repeated freezing and thawing. Source: Expressed in E. Coli, methylation modified. Trypsin specifically hydrolyzes peptide bonds at the carboxyl side of lysine and arginine residues. Recombinant trypsin is free of any other proteases activities, and TPCK is unnecessary and not contained. 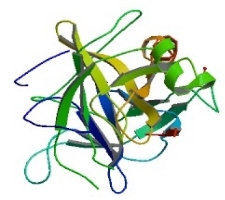 Unmodified trypsin is subject to auto-proteolysis, generating fragments that can interfere with protein sequencing or HPLC/MS peptides analysis. rendering it resistant to proteolytic digestion. Liquid in 50mM HAc, or fluffy solid. No any other proteases activities contaminant. with BAEE as a substrate (1cm light path). Protein digests for peptide mapping applications or protein identification by peptide mass fingerprinting or MS/MS spectral matching. It is suitable for digestion reactions in-solution or in-gel. 1. To dilute recombinant modified trypsin with 50mM HAc if needed. When used, dilute it with 50mM NH4HCO3 or pH7-8 buffers directly. 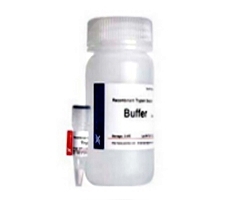 1mM CaCl2 is recommended to be contained in digestion buffer. The ratio to aimed protein is 1:20 to 1:100 (w/w), the optimum pH is pH7-8. 2. To use this product, thaw at room temperature, mix gently before use. 3. No activity lost when freeze-thaw 5 cycles. 1. The solution should be stored under -70℃, It is stable within 24 months. 2. Above 95% activity remained after 5 times repeated freezing and thawing. at 37 ℃ in 50mM NH4HCOFor long-term such as 20hours incubation, 1mM CaCl2 is recommended to be contained. Source: Porcine trypsin, expressed in E.coli. 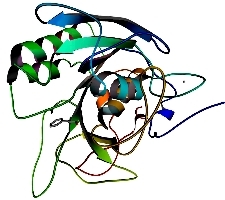 Trypsin is a member of the serine protease family. and arginine amino acid residues. and purified by high pressure liquid chromatography. There are no contaminating enzyme activities such as carboxypeptidase A and chymotrypsin. No protease inhibitors such as PMSF are contained in the preparation. and other potential adventitious agents found in animal derived trypsin. YaxinBio Recombinant Porcine Trypsin belongs to the AOF level 3.
in the process of transport and storage. 2)No other contaminating proteases such as chymotrypsin or carboxypeptidase A.
in a reaction volume of 3.0ml at pH7.6 and 25℃, with BAEE as a substrate (1cm light path). To prepare 1-10mg/ml recombinant trypsin with 1mM HCl. The ratio to aimed protein is 1:50 to 1:1000(w/w), the optimum pH is pH7-10. 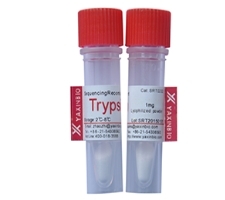 Recombinant trypsin lyophilized should be stored under 2℃-8℃ in sealed container. It is stable within 24 months. After dissolved, it should be stored under -20℃. Source: human trypsin, expressed in E. Coli. 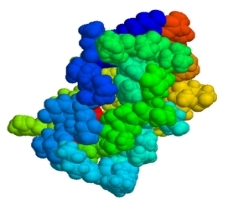 Trypsin cleaves peptides on the C-terminal end of lysine and arginine amino acid residues. e.g. PMSF, and by metal chelating agents, e.g., EDTA. by high pressure liquid chromatography. and of any other potential adventitious agents found in animal pancreas-derived trypsin. 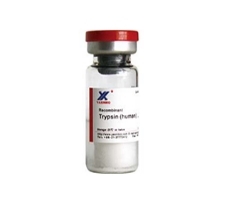 YaxinBio Recombinant Human Trypsin belongs to the AOF level 3. Recombinant human trypsin:The amino acid sequence is the same as the Human Trypsin 2.
and decreases the chance of activity loss in the process of transport and storage. contaminating activities found in lower purity enzymes. 3) Purity is more than 95% by HPLC. ≥ 2500 USP u/mg pro. of 3.0ml at pH7.6 and 25℃, with BAEE as a substrate (1cm light path). 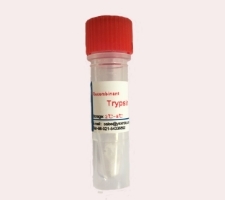 Recombinant human trypsin lyophilized should be stored under 2℃-8℃ in sealed container. It is stable within 24 months. After dissolved, it should be stored under -20℃. Source: human chymotrypsin, expressed in E. Coli. the gene sequence is the same as human chymotrypsin. Tyr, Phe and Trp. Cleavage may also be observed, but at a lower rate, at Leu and Met. Chymotrypsin activity is optimal in pH 7.0–9.0. 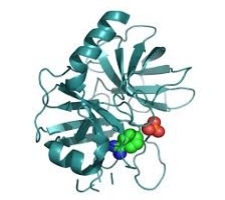 potential adventitious agents found in animal-derived chymotrypsin. other proteases activities found in enzymes purified from pancreas. chance of activity loss during transport and storage. Hydrolysis of proteins by chymotrypsin alone or in combination with other proteases. Suitable for peptide mapping, fingerprinting, and sequence analysis. UNIT DEFINITION: One unit will hydrolyze 1.0 μmole of BTEE per min at pH 7.8 at 25 °C. 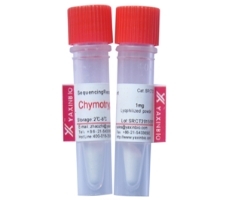 Recombinant Chymotrypsin lyophilized should be stored under 2℃-8℃ in sealed container. Chymotrypsin activity is optimal in pH 7.0-9.0.
by peptide mass fingerprinting or MS/MS spectral matching. ≥ 98 % by HPLC. or MS/MS spectral matching. It is suitable for digestion reactions in-solution or in-gel. 2) This sequencing grade enzyme can be used alone or in combination with other proteases to produce. used once time or stored below -20℃. added chymotrypsin (in general, W:W=1:50) . Self digestion may occur if temperatures above 37°C. Source: Protein A mutant of Staphylococcus aureus , expressed in E. Coli. 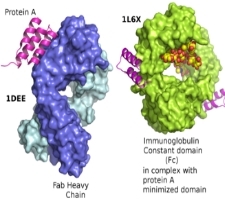 The recombinant Protein A is a genetically engineering protein containing IgG-binding domains. Recombinant Protein A is ideal for purification of polyclonal or monoclonal IgG antibodies. pig and rabbit total IgG form. enzyme markers, biotin, colloidal gold and radioactive markers). These coupled derivatives can be used in antibody test in the process of Western-blot, ELISA or immunohistochemical tests. 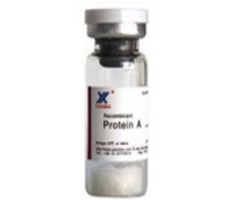 Recombinant Protein A lyophilized should be stored under 2-8℃in sealed container. It is stable within 24 months. For Research or Manufacturing Purpose Only. Not for Human. 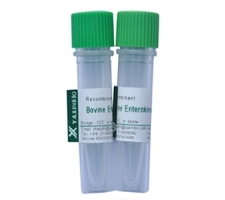 YaxinBio Enterokinase is a kind of highly purified recombinant bovine enterokinase. to get aim protein with native amino acids sequence. 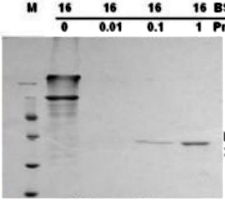 2) No any other contaminated proteases, no non-specific cutting sites. Time: over night or 12h-16h for digestion. ＞200mM imidazole or ＞200mM NaCl or 5%glycerin, the reaction may be effected. ＜5% glycerin, and the proportion of fusion protein and EK may not be changed (1U:0.5mg fusion protein). suggest to increase the content of EK in reaction system or extend the reaction time. One unit is defined as the amount of enzyme needed to cleave 0.5mg of fusion protein in 12 to16 hours to get 95% completion at 25°C in 25mMTris-HCl,pH 8.0. Substrate: a special fusion protein. Keep cool with blue ice during shipping. Remained stable at 25°C for one week without activity lost. No activity lost after 5 cycles of frozen-thawing. Recombinant trypsin solution, is an animal component free trypsin solution optimized for cell dissociation. It is formulated with recombinant human trypsin expressed in E.Coli and refolded and purified by chromatography. The sequence of recombinant human trypsin is same as human trypsin 2 sequence. 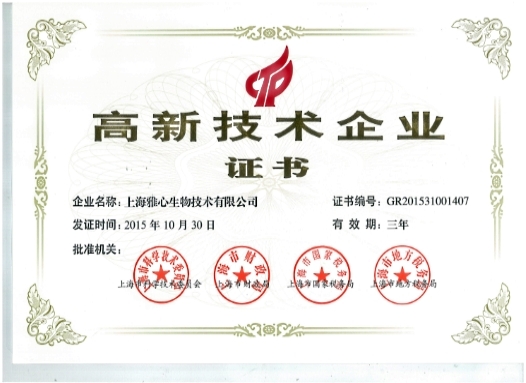 Recombinant trypsin, no bacteria, mycoplasma, mold and virus was found and bio-burden is conform to biological standard, eliminates the risk of viruses, or other potential adventitious agents. Recombinant trypsin owns a similar kinetic of cell detachment to native trypsin. Soybean trypsin inhibitors and other inhibitors work the same way with recombinant human trypsin as they do with native trypsin. in 1:250 trypsin or other animal origin trypsin. and storage. It also eliminates the contamination risk that a lyophilized powder has. Recombinant trypsin solution is formulated at an optimal concentration to dissociate adherent cells. and then eliminate EDTA influence on cell apoptosis experimental analysis. Step 1. Pour 1 ml buffer solution into EP tube containing trypsin powder. and mix. Best use it within 4 hours. Note 1. Dissociate adherent cells under room temperature ; 37 ℃ is not recommended. then stored under -20℃. To use it, dissolve it at room temperature. Note 3. The content of trypsin is 2000 BAEE unit/ml as above prepared. If necessary, dilute it to 1000 unit/ml or others based on your experimental results. Aprotinin is a competitive serine protease inhibitor that inhibits trypsin, chymotrypsin, kallikrein and plasmin. 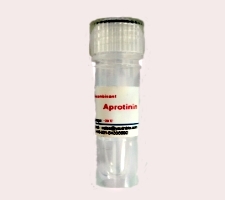 Aprotinin forms stable complexes with and blocks the active sites of enzymes. Binding is reversible with most aprotinin,protease complexes and dissociating at pH >10 or <3. Effective concentration is equimolar with protease. Recombinant aprotinin is expressed in E. Coli, and purified with HPLC. where one trypsin unit will hydrolyze 1.0 μmole of N-benzoyl-L-arginineethyl ether(BAEE) per sec at pH 7.6 at 25 °C. A conversion factor for Aprotinin is: 1 EPU = 1 USP Aprotinin Unit = 1800 KIU. Recombinant aprotinin should be stored under -20°C or below in sealed container. It is stable within 24 months. Pro-Arg in pro-α,factor and killer-toxin precursors maturing, it was discovered in Saccharomyces cerevisiae. 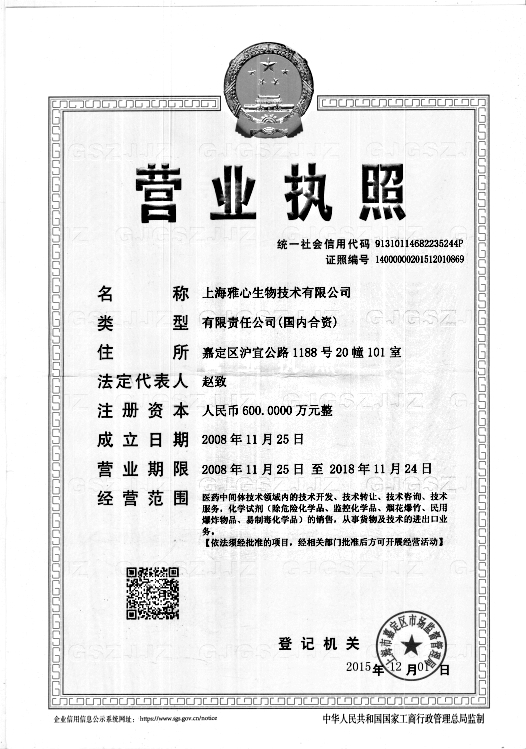 But Kex2 can’t recognize and cut a single basic amino acid,such as carboxyl end peptide bond of arginine and lysine. 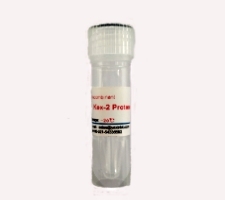 Recombinant Kex2 is a genetically engineered protein expressed in Pichia pastoris and purified by high pressure liquid chromatography. 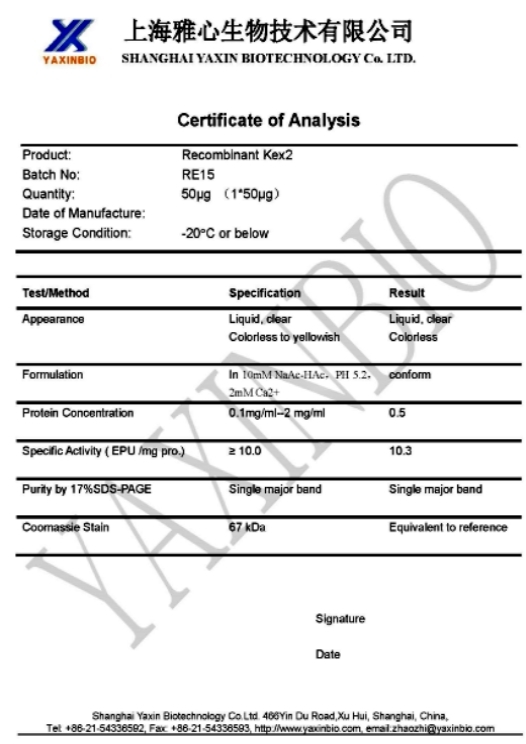 The optimal pH of Kex2 protease is 9.0, and the optimal temperature is 37 ℃. It is stable in buffer (pH 5.0-6.0). The activity of Kex2 is not affected by the conventional serine protease inhibitors such as PMSF, TPCK, TLCK inhibition. in a reaction volume of 3.0ml at pH8.0 and 25℃. Recommended storage temperature: -20 °C or below. It is stable after 5 cycles freezing and thawing. Transport temperature: ≤ 8 °C. It should be stored in 10mM NaAc-HAc(PH 5.2) and 2mM Ca2+. to glutamic acid residues. It also cleaves at aspartic acid residues. and alpha 2 - macroglobulin and Na-p-tosyl-L-lysine chloromethyl ketone (TLCK). Approx.20U/mg ar 25℃ with Z-Phe-Leu-Glu-4-nitranilide as the substrate(approx.500U/mg at 37℃ with casein as the substrate). 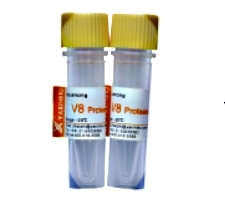 V8 Protease should be stored under -20℃ in sealed container. 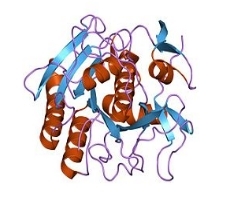 Proteinase K is a non-specific endonuclease protein, belongs to the serine protease enzyme, can cut the ester and peptide bond on the carboxy-terminal of aliphatic, aromatic and hydrophobic amino acids, and is used for protein degradation in biological samples. The Molecular weight is 28.9 kDa (monomer), is active under the conditions of pH4 to pH12 , is also very stable while the presence of SDS, urea, or EDTA. This enzyme was purified by discoloration and chromatography to remove RNA and DNA, without other miscellaneous activity be detected. 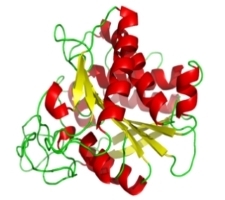 Since the stability of proteinase K in urea and SDS, and also has the ability to degrade the natural proteins, it hydrolyses four peptide molecules at minimum. High purity: No other miscellaneous activity: Enzyme cutting with no other side effects. High yield. Mainly used in genetic diagnostic kits, genomic DNA extraction kit, RNA extraction kit for removing the nuclease in the preparation of DNA and RNA. such as in the preparation of DNA vaccines and heparin , etc., may also be used for the preparation of chromosomal DNA and protein blotting. activity Unit Definition: under 37 ℃, pH 7.5 conditions, proteinase K amount to generate 1 μmol tyrosine per minute by from the hydrolysis of the substrate casein is defined as one unit (U). can be cryopreserved at 0 ~ 4 ℃ condition for dry powder status. With -20 ℃ storage for dissolved aliquot of appropriate volume. transportation can be carried out at room temperature.